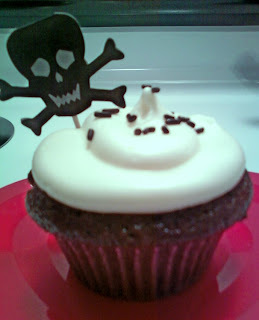 Flour Mayhem: Chocolate Mint Cream Cupcakes! I always enjoy friends birthdays. It gives me a reason to get down in the kitchen, and you all know how much I love that. This coming Monday is Travis's birthday. He is a great friend of Jason and I, and the least I could do for him was bake him some yummies. He has been dropping hints about how much he loves Andes mints and chocolate mint, etc. So I already had it in my head that it needed to be chocolate and mint. And that's just what I did. 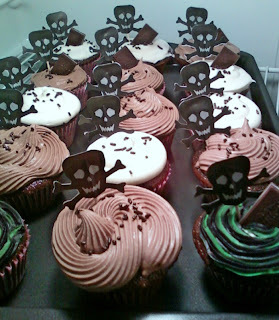 I love adding fillings to cakes and cupcakes. It's always a nice little surprise! I did a chocolate cream filling with mint cream icing, and then mint cream filling and chocolate cream icing inside chocolate cupcakes. I then topped some of those bad boys with Andes mints, some chocolate jimmies - Man, I love chocolate jimmies, you don't even know! And a little skull decoration. I figured Travis would dig it. 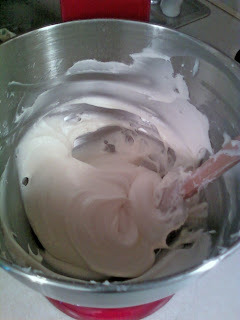 I also had found this swirled premade frosting by Wilton in green and black. I figured it'd be cute and fit right in with the cupcakes, I only used it on 3 of them since I thought of this when I was almost done. Turned out really cute, but next time I'll just stick to dual bags if and when I want a swirled frosting. I just prefer homemade frostings, I know what's in it, and it takes 5 minutes ya know? 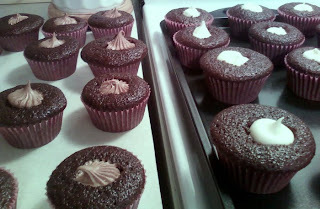 Speaking of frosting..
For the cupcakes, I used the chocolate cupcake recipe HERE! Cream together the butter and c.c, Add in one cup of the powdered sugar, and beat until creamy. Continue to add the other cup, and repeat if you feel you need more sugar. After you are done adding as much powdered sugar as you need/want, then stir in the teaspoon of peppermint extract.. Viola! After following the recipe for the chocolate cupcakes, let them cool completely. 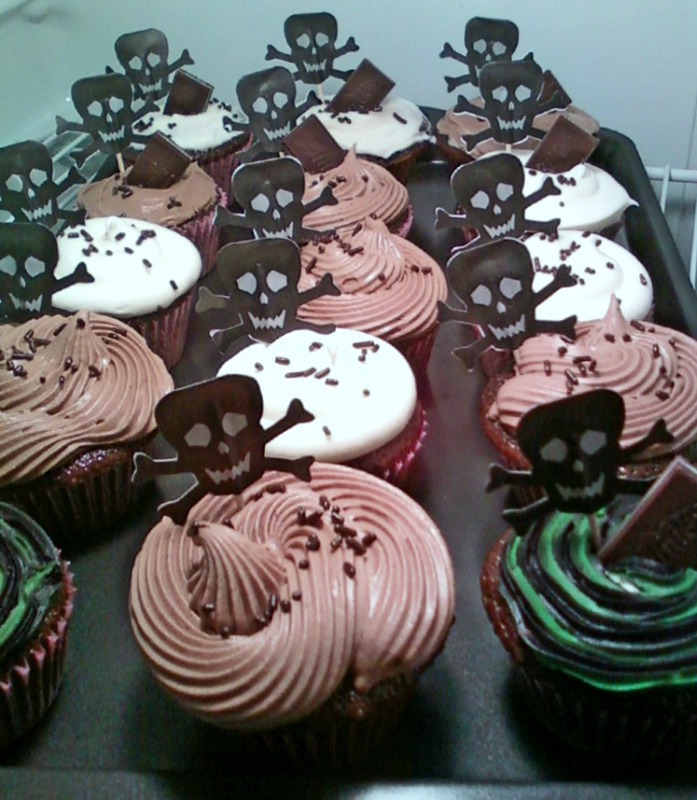 Using a sharp knife, cut small circles into/out of the cupcakes. Making sure not to go all the way to the bottom. Pipe in the filling! Oh my gosh - you are amazing! How do you continue to come up with such GRRRRRRRRRRREAT recipes!